If you’ve ever visited Italy, it’s very apparent that pasta comes in more shapes and sizes than one can imagine, but let’s not overlook the iconic Lasagna, or as it’s known in Italy, Pasta al Forno! 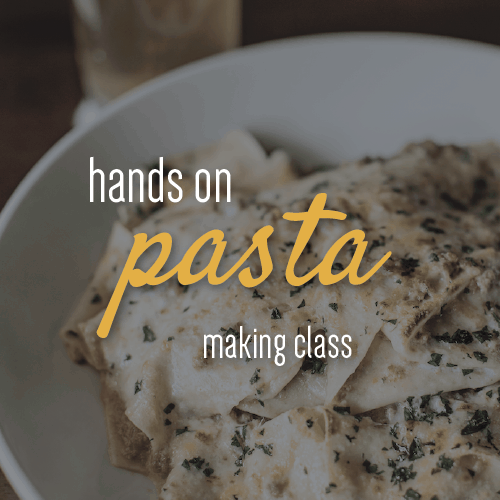 Chef Jamie will coach you on all aspects of Pasta al Forno (which means from the oven) from the pasta dough to the market ingredients or your refrigerator! We are going to take the mystery out of “lasagna” and make it very easy to produce a spectacular version in a shorter amount of time than one would think. From enjoying Pastry Chef Libby Muldawer’s freshly baked Biscotti along with coffee and Prosecco, right through lunch dining on the wonderful Pasta al Forno you’ve prepared, this will be an experience you will always remember. Wines will be served along with your Pasta al Forno, and we will provide a packet of recipes for you to take home. This is going to be a super popular class, so make sure to book early. Reservations are extremely limited – we only have 14 seats available.